There are some very important things to do before you sell your home – whether you sell by owner or real estate agent. First, review your Park’s rules and regulations, rental or lease agreements for important information regarding selling your home and signs that may be posted regarding the sale. Prior to purchasing a manufactured home located in a rental park, the prospective buyer must be approved for tenancy in the park by the owner of the park. The sale of a mobile home located in a mobile home park is a three-party, not two-party transaction. The buyer and seller must not only agree to terms on the sale of the home, but the buyer must also be approved for residency in the park by the park owner/management. 1) the buyer’s inability to pay the rent and charges of the park and 2) the buyer’s inability to comply with park rules and regulations as indicated by prior tenancies. Although guidelines used by other landlords or public agencies for rental housing may be more lenient, many park owners impose higher income requirements to assure buyers will be able to afford future rent increases without causing the park problems, such as evictions. The seller of a manufactured home must provide the buyer with certain disclosures, electrical equipment and appliances. In 1621, the Plymouth colonists and Wampanoag Indians shared an autumn harvest feast that is acknowledged today as one of the first Thanksgiving celebrations in the colonies. 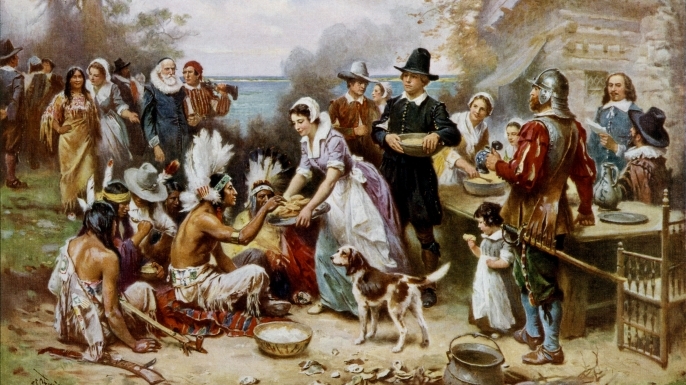 For more than two centuries, days of thanksgiving were celebrated by individual colonies and states. But, it wasn’t until 1863, in the midst of the Civil War, that President Abraham Lincoln proclaimed a national Thanksgiving Day to be held each November. In September 1620, a small ship called the Mayflower left Plymouth, England, carrying 102 passengers. After a treacherous and uncomfortable crossing that lasted 66 days, they dropped anchor near the tip of Cape Cod, far north of their intended destination at the mouth of the Hudson River. One month later, the Mayflower crossed Massachusetts Bay, where the Pilgrims, as they are now commonly known, began the work of establishing a village at Plymouth. Throughout that first brutal winter, most of the colonists remained on board the ship, where they suffered from exposure, scurvy and outbreaks of contagious disease. Only half of the Mayflower’s original passengers and crew lived to see their first New England spring. In March, the remaining settlers moved ashore. The local Indians taught the Pilgrims, weakened by malnutrition and illness, how to cultivate corn, extract sap from maple trees, catch fish in the rivers and avoid poisonous plants. In November 1621, after the Pilgrims’ first corn harvest proved successful, Governor William Bradford organized a celebratory feast and invited a group of the fledgling colony’s Native American allies, including the Wampanoag chief Massasoit. Now remembered as American’s “first Thanksgiving”—although the Pilgrims themselves may not have used the term at the time—the festival lasted for three days. Historians have suggested that many of the dishes were likely prepared using traditional Native American spices and cooking methods. Because the Pilgrims had no oven and the Mayflower’s sugar supply had dwindled by the fall of 1621, the meal did not feature pies, cakes or other desserts, which have become a hallmark of contemporary celebrations. Abraham Lincoln in 1863, at the height of the Civil War, in a proclamation entreating all Americans to ask God to “commend to his tender care all those who have become widows, orphans, mourners or sufferers in the lamentable civil strife” and to “heal the wounds of the nation.” He scheduled Thanksgiving for the final Thursday in November, and it was celebrated on that day every year until 1939, when Franklin D. Roosevelt moved the holiday up a week in an attempt to spur retail sales during the Great Depression. Roosevelt’s plan, known derisively as Franksgiving, was met with passionate opposition, and in 1941 the president reluctantly signed a bill making Thanksgiving the fourth Thursday in November.